Talk about a catchy blog title, right? Before anyone thinks I’m here to set fires, I’m not. The goal of this blog post is to give gymnastics and the medical world information, tools, and practical strategies to approach the topic of split and over split training. Before I dig into the specifics, remember that you can now download the exact exercises, flexibility drills, and circuits I use to improve split flexibility. 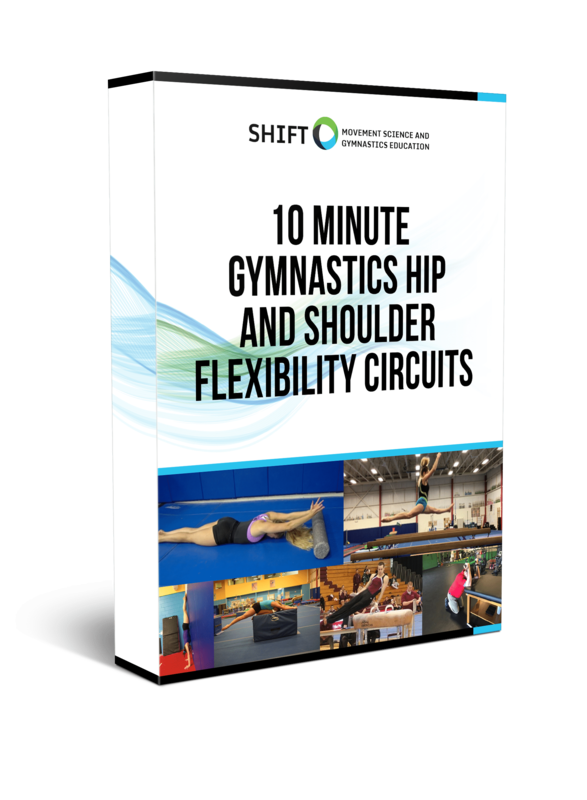 You can get it inside my “10 Minute Gymnastics Flexibiltiy Circuits” by signing up for the SHIFT Gymnastics newseltter. Hopefully, I can meld current science with the reality of needing to train flexibility in the gym and some rehabilitation concepts for some helpful insight. As with all of my blog posts, many of the errors I feel exist in split flexibility training I have definitely made myself. It’s all about being open to learning more and doing what is best for the gymnasts in our sport. 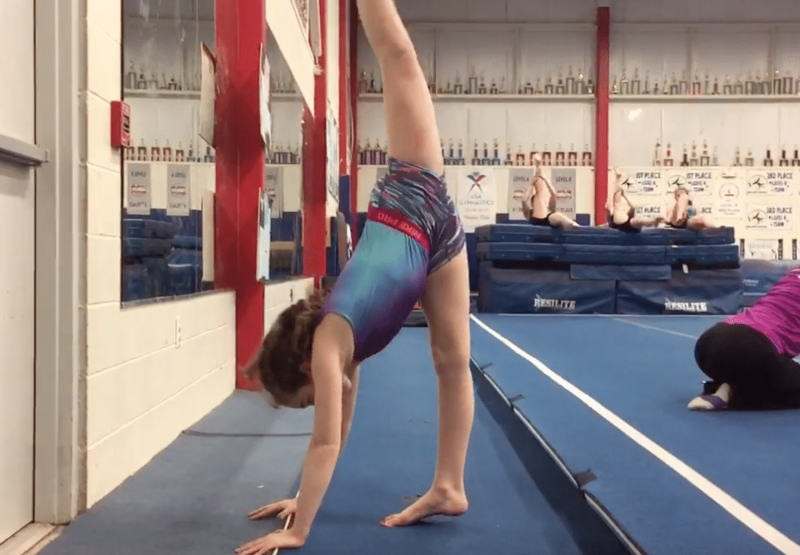 These questions are important to consider, as knowing how to safely developing hip flexibility and being able to show great lines in gymnastics skills, is essential for gymnastics success. I used to be very polarized on this topic saying that oversplits were not in our best interest for gymnastics. However, I also believe we should be constantly learning new ideas and challenging our beliefs based on what the most current research says and what methods produce results. I also want to make sure that we are being realistic about what needs to happen in gymnastics training to be successful. In the most basic sense, I don’t think oversplits in themselves are “bad for gymnasts”. I think the more accurate way to describe it is that an oversplit may be bad for a particular gymnast at that moment in time. Forcing a split to go down without a proper assessment behind it, pushing oversplits when the gymnast isn’t even close to a full split on the floor, or blindly pushing someone down just to be tough, is most definitely dangerous. The main reason (more below) is because the “stretch” pain reported may be coming from a few overlapping body structures, some we should be aiming to target (muscles, fascial tissue, some tendinous) and some we should not be (bony joints, ligaments, capsules, labrums, etc). For example, this research study and this research study recently looked at professional ballet dancers in a full middle split and took x rays of their hips. They found that to achieve this full straddle split there was evidence of micro subluxation in the hip joints of the ballet dancers. This finding isn’t inherently dangerous, bad, or good as research always has it’s own internal issues. That being said, it certainly raised some thoughts for me about making sure the methods we use for split training are sound, and what hip joints go through for over splits. We also seriously need to consider the fact that many gymnast have open growth plates, and can suffer from ischial apophysitis / growth plate fracture if we force motion (more in this research study here). Splits and over splits should not be viewed as an inherent thing a gymnast has or doesn’t have. It should be viewed as a skill with many pieces that must be broken down to achieve. Using proper movement assessments, understanding the anatomy, and a “consistency over intensity” mindset is what will reduce injury risk and increase gymnastics performance. Now after saying that inherently over split training is not going to automatically cause injury, we all must realize that there are very real and serious consequences for not approaching split flexibility training correctly. I strongly feel that gymnasts must “earn the right” to do over splits, and must be mature enough to do them safely. Simply throwing a bunch of random flexibility drills at a group of gymnasts recently seen from a clinic or online video, pushing a gymnast down, or not taking the time to break down why someone is limited can lead to serious injuries. Before you apply new flexibility ideas, take a step back and consider the scientific rationale behind exercises, and brainstorm how to divide out the group of gymnasts who may need an alternative exercise. 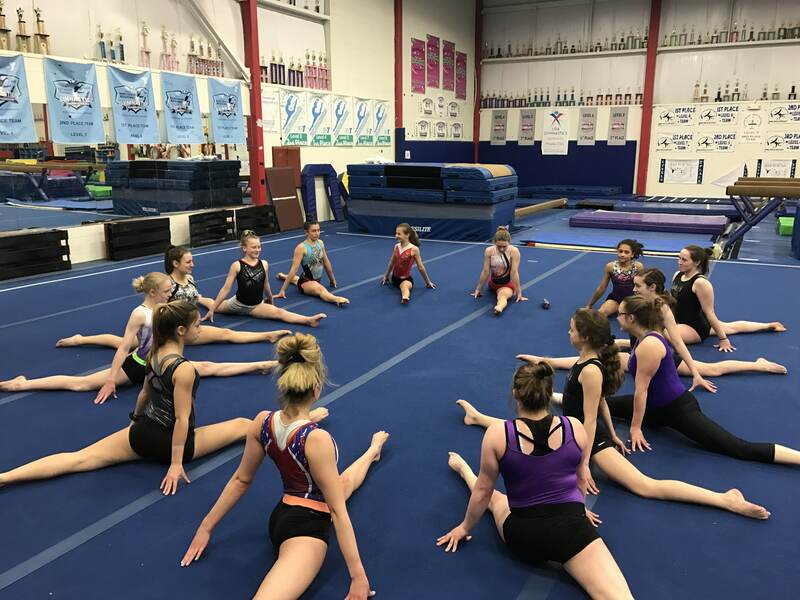 Recently, many gymnasts are reported to have “hip flexor strains” that should be trained through, when in reality they have much more serious ligament, capsule, joint, or labral injuries that are a big deal. This study, this study, and this study have outlined how hip ligaments and the hip labrum may get strained at very end ranges that are unprotected. I will say take these with a grain of salt due to their methods, smaller sizes, and sometimes using cadavers as models. It’s not that we want to freak out every time someone is reporting discomfort in a split. However, practically in gymnastics training it definitely means we need to understand that forcefully pushing oversplits, not being open to learning some anatomy, or ignoring serious pain complaints from gymnasts is not okay. Sadly many more young gymnasts are requiring hip surgery, as well as retired gymnasts or older adults years after being done with gymnastics. Part of this may be inevitable for high-level gymnastics, but we should be doing anything we can to reduce risk. A blind approach to gymnastics flexibility training can cause some serious hip injuries as the current medical research field has demonstrated. Labral tears may progress to need involved surgery, may put out of training for many months or forcing them to quit gymnastics, and long-standing hip microinstability may be created without the proper training approach. If you are more curious about learning the medical side of hip injuries in hyper flexible athletes, I highly recommend reading these articles. With all of this in mind, here are some steps or underlying principles to consider when approaching split flexibility training. We all have exercises and specific flexibility methods in mind which I’m sure are great. After making sure they are appropriate and safe, find out where they fit in this type of step by step thinking, and you will see some big results. The most important starting place to helping someone gain flexibility or a achieve better split is to fully understand why they do not have a split in the first place. If a gymnast has a specific bony structure that does not allow them to achieve a certain position, that absolutely must be known. Without knowing this, using general flexibility drills may just waste time and most likely cause pain. A good sports Physical Therapist, Athletic Trainer, Sports Chiropractor, or another medical provider can do specific tests to really narrow in on why they can not achieve the desired split position. It could be a boney issue, muscular stiffness, strength limitation, technique issue, or a combination of a few factors. Without an assessment, you will never know. Second to knowing why someone is limited, we have to make sure muscular soft tissue is always the focus of flexibility methods for gymnasts. Most often than not, gymnasts are naturally hypermobile and have ligament/capsule laxity that allows them to be involved in gymnastics in the first place. Think of it as a natural selection type progress; just like me being 5’6 certainly doesn’t lend me to naturally being a great NBA basketball player. The same concept applies for gymnasts and their natural laxity. They often have plenty of motion coming from their hip joint and ligaments, and we do not want to create more that may lead to instability. On a related note, I will say that I typically promote gymnasts move up on a mat so that more of their leg is supported. The picture above is what is most commonly done, which is why I chose it as an example. We don’t want to put hyper extension stress on the front leg, so I feel putting more of the calf on the mat is the best choice if oversplits are being trained. I teach gymnasts to be fully engaged with their core, hips, and alignment during splits rather than just passively sit/push to end range, which is when I feel this ligament or labrum stress occurs (supported by this study here). There are certain muscular areas in a gymnast’s lower body (calves, inner thigh, hip flexors and quads) that get overused and tend to stiffen up during training. These are the areas we want to really target. Using foam rolling, other soft tissue devices like lacrosse balls, very specific targeted stretching based on the science of anatomy and hip joints, and active flexibility drills is often enough to get the job done when consistently performed. From here, we have to remember that a warm up is a time to just prep the available motion that an athlete has. It’s not a great time to force and try to gain more motion. My current thoughts are that when ligaments are looser and soft tissue is stiff, working the split itself may cause a split to go down, but for the wrong reasons with ligaments getting further stressed. For this reason, I feel gaining flexibility is best done in a separate time. Usually it’s best at the end of practice or after a full warm up to increase body temperature, and in more of a “circuit” based approach rather than just stretching alone. Once proper soft tissue flexibility has been worked, we really need other muscles around the hip joint to be extremely strong to support motion occurring for a split. The glute muscles (maximum, medius, minimus) along with much deeper, smaller hip stabilizer muscles and the core have to work together to achieve such larger ranges of motion. I often regularly recommend “hip care” is done for gymnasts that target these areas very specifically. Single or double leg hip lifts, deadlift variations, side band walks, clamshells, side planks, and many other great exercises all can be used to enhance the strength needed to safely perform over splits. One of the biggest mistakes I think we all make in gymnastics just only focusing on muscle flexibility and stretching, but never following it up with full range control and strength. Many refer to this as “active flexibility” meaning we are trying to bridge the gap between what a gymnast can do passively on the floor for a split, and what shows up in the events. Dr. Sands has some great research on the use of active flexibility and proper elastic band kick exercises increasing flexibility. I am a huge fan of ending flexibility circuits with drills like he suggests, hip control drills, and other strengths work during flexibility circuits. Some people contact me saying that all rhythmic dancers do is use extreme flexibility drills, and they seem to be fine. I’m not going to lie, I’ve seen some pretty insane flexibility drills on the internet that have very little scientific or anatomical rationale, which makes me very nervous. My first argument would be behind the scenes I bet that have quite a few hip injuries as well. Second, the demands of rhythmic vs artistic gymnastics are quite different. Artistic gymnastics athletes do insanely high force skill, hundreds of times per week, during peak growth periods where they are very at risk. For this reason, this is why I feel we can’t compare apples to oranges and artistic gymnasts must train for a very high level of hip strength to back up all their flexibility. To finish circuits off from above I think it’s important to do gymnastics specific hip drills to transfer new found flexibility to skill. Jumps on Tramp/Rod Strip, more intense active flex drills, or doing beam circuits can be really helpful to really make new found flexibility stick after soft tissue work and control drills are done. Whatever specific skill you are looking to improve, spend some time on the technique and drills for them within your flexibility circuits. This is more of a lesson to teach gymnasts, but the super mobile and naturally bend gymnast shouldn’t always be encouraged to do extreme flexibility just for the sake of it. Showing off a 5-panel over split or bending their back in half when younger may look cool, but in the long run, may doing more harm than good. I suggest gymnasts and coaches gain the required flexibility needed for skills and then work hard to get strong in that range of motion and protect themselves. Closely related to this gymnasts, gymnastics coaches, medical providers, and anyone else involved must know when or when not to keep working over splits through discomfort. A moderate level of stretch based discomfort in the muscles themselves is expected, if not required, to improve splits. One theory supported in this research paper talks about how desensitizing nerve endings in the muscles may be a big reason why we see long-term changes in flexibility over time. This fuels my “consistency over intensity” thought process. It’s beyond crucial we don’t ignore more serious complaints of pain (keeping in mind the age/level of our athlete) especially if they are ongoing and create a reduced performance. Sharper hip joint pains, chronic “hip flexor strains”, or a progressively worsening split with pain need to be talked about. Want to Learn More and Get my Favorite Split Flexibility Complex? These ideas all come from some “Performance Complexes” I have put together based on all the research I read. I think it’s important coaches have tools they can use that have current information on split flexibility and how to practically apply it in the gym. If you would like to download the PDF containing all the foam rolling, stretching, active flex, and strength drills I like using to improve splits, I’m happy to give it to you. Just sign up for the SHIFT Gymnastics Newsletter below and I will send you the download link. So for now, I hope that this blog post was much more information and sharing based than provocative. All I really want to do is help gymnastics evolve, increasing the performance levels of gymnasts and at the same time reducing their risk of hip injuries. Although there is still much more to learn and think about, I think these concepts are a really good start. Thanks for reading, and I hope you found it helpful! Wow, I am glad to have found this blog post. I did competitive gymnastics up to a few years ago and I had to retire due to a labral tear in my hip, for which I recently got surgery. I remember being constantly pushed down in oversplits while training. I am now a coach myself, and this post definitely makes me rethink the way we work flexibility in the gym. I hope I can help my gymnasts avoid hip injuries such as mine. Thank you again for this very interesting and helpful article.